Special Forces demonstrate skills in combatting terrorism from helicopters after a launching of join patrol between Malaysia, Indonesia and Philippine at the Subang military airbase in Petaling Jaya, Malaysia, Oct. 12, 2017. Indonesia, Malaysia and the Philippines began coordinated air patrols Thursday to intensify their fight against Islamic militants who have laid siege to a southern Philippine city. The siege in the Philippine city of Marawi has raised fears that the Islamic State group's violent ideology is gaining a foothold in the country's restive south, where Muslim separatists have fought for greater autonomy for decades. 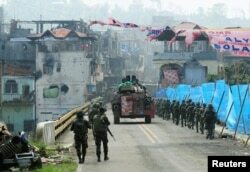 FILE - An Armored Personnel Carrier (APC) and government troops march towards Mapandi bridge after 100 days of intense fighting between soldiers and insurgents from the Maute group, who have taken over parts of Marawi city, southern Philippines Aug. 30, 2017. Malaysian Defense Minister Hishammuddin Hussein said Thursday the conflict shows that terrorist organizations affiliated with the Islamic State group have exploited the region's porous borders and linked up with local terrorist groups. He said the air and maritime patrols are aimed at "deterring the use of these back channels and counter the movement of violent extremists and terrorists across the borders of our three nations." It is especially important to secure the sea lanes because about $40 billion worth of trade transits through the Sulu Seas each year, he said. Authorities in Indonesia, the world's most populous Muslim nation, have carried out a sustained crackdown on militants since bombings on Bali in 2002 by al-Qaida-affiliated radicals that killed 202 people. In recent years, it has faced a new threat as the rise of the Islamic State group in the Middle East has breathed new life into local militant networks and raised concerns about the risk of Indonesian fighters returning home from fighting with IS.